In the most recent Washington Monthly, John Sides asks, “Do Presidential Debates Really Matter?” He answers in the subheading: past ones didn’t. Sides cites a host of polling on the various elections that conventional wisdom dictates were decided by debates (1960, 1980), polling that does not show any post-debate “game changes.” This argument is part of a broad trend in political science that aims to reduce the importance of punditry and the various “message” and “narrative”-based analyses that get thrown around on cable news. Generally speaking, the foundation of these critiques is correct. It’s much easier to predict elections based on data and current broader economic fundamentals than, say, the often-indefinable quality of the campaigns. And of course, many of the moments from presidential debate history that are remembered as definitive and in some sense determinative of the outcome have been overblown—just look at the way most people remember the debate in the 1960 election as a knockout. But that doesn’t mean that the debates aren’t important. They can, at least occasionally, present voters with genuinely new information and reveal something about the candidates. They can snap a particular picture of a candidate into focus, alternatively saving or damning them. And they can send a message both to die-hards in a party and to the elites whose support is immensely important to national campaigns. Those elites are most important in primary debates, which are probably the most notable omission from Sides’s analysis—he is largely correct that general election debates don’t swing the polls, but the primary ones are more potent. There are a host of other reasons why the general election debates might not sway public opinion (most notably that the candidates are both known quantities, rendering debates relatively useless as a way of informing the public), but primary candidates who were relatively unknown can gain exposure and land serious blows in debates. Ronald Reagan did this successfully in 1980 with his “I paid for this microphone” moment. Last fall, Rick Perry’s campaign was sent over the edge with his “oops” moment. That’s a longwinded way of saying that the Democratic primary debates were actually important in 1984. The field was relatively competitive. Ted Kennedy had been the frontrunner going into election season after his performance in 1980. After he declined to run, the field narrowed to four serious candidates: Rev. Jesse Jackson, Ohio senator and former astronaut John Glenn, Colorado senator Gary Hart, and former vice president Walter Mondale. Though Mondale was the favorite at the beginning of the primaries and held onto his frontrunner status throughout (spoiler alert: he got the nomination), the other candidates, Hart in particular, did give him trouble. Hart finished second in the Iowa primary and emerged thereafter as the alternative to Mondale (think of Barack Obama more or less knocking John Edwards out of contention in 2008 after winning Iowa). The senator won several more primaries prior to the beginning of the debates. Mondale ultimately had more serious and durable advantages as the broad consensus candidate of the party, but the debates provided him a huge opportunity to undercut Hart and consolidate his support from undecided Democrats. Before we look at the big moment of the 1984 primary debates (and probably the most important moment of the whole cycle), let’s take a look at a more typical exchange. The candidates were asked what they would do if an unidentified Czechoslovakian plane were to enter U.S. airspace at 2 a.m. heading straight for Colorado Springs—a strategic location for the American missile command. The question alluded to Korean Airlines Flight 007, which the previous year had ended up west of its scheduled path, violating Soviet airspace. The Soviet military shot it down, killing all 269 people on board including Congressman Lawrence McDonald of Georgia. KAL007 was representative of the difficult foreign policy situations the nation found itself in during the Cold War, and of the supposed weak point of Democratic candidates. Again, the demeanor and sort of responses from the candidates was remarkable compared to current political norms. Hart’s answer (and Mondale’s) is flippant, and as Glenn points out, ridiculous. If the people in the plane weren’t wearing uniforms, that would mean they were definitely civilians? Hart’s response here indicates something important about the way these candidates saw the debates. He defends himself by saying that the question had included the caveat that they could see inside the plane. Who cares? The debates are meant to be demonstrations of readiness for the presidency, not… well, debates. In debate as academic activity (or game), technicality is a virtue that makes it easier to win. But winning isn’t always the same as persuading, which we’ll see in the general election. Part of what makes this exchange (which, keep in mind, didn’t even end up being that important) so fascinating is the casual way it sometimes seems like, yes, these are just a couple of guys chatting. The effect is partly due to an “old boys’ club” vibe throughout, but it does seem to lower the stakes at least somewhat. Comparing the spectacle of the 2012 primaries to this relatively relaxed forum makes it easy to blame the current state of debates on the evolution of the political process, but it’s a television issue too. Maybe it’s just me, but these debates are much worse at holding attention than the current incarnation, which is kind of like watching people skip through a minefield. And the trend toward going bigger on TV was taking hold in 1984—compare shows that ended that year (AfterMASH, Happy Days) with ones that started (Miami Vice, V). Mondale’s line, as with many of the other memorable campaign moments, crystallized a popular line of attack against Hart—that his policy proposals had no, erm, meat. But that loss of standing has even more importance in primary debates. Look at how everyone else reacts. The crowd laughs. The moderator mocks Hart by claiming he’ll tell Mondale where the beef is, “on a roll or something.” Hart gets the chance to respond, but he again doesn’t say much of substance, and there’s no oxygen in the room anymore. Even after watching a few times to really listen to his answer, I can barely pay attention to anything Hart says. Maybe I just have a short attention span. It’s lucky for Mondale that “Where’s the beef?” was such a winner, because within 30 seconds, he manages a verbal mix-up that in 2012 would have fueled a mini–campaign cycle. His reply explaining the substance of his campaign, which otherwise makes him look like the adult in the room compared to Hart, includes the line, “I’m going to stand up for special interest groups.” Mondale also benefited from being a much better known candidate, and much more resistant to caricature than Hart. Often in primaries, voters (particularly in the party’s base) are just getting to know the candidates, which makes those pols far more vulnerable to broad attacks. Hart’s humbling was the sort of thing that is difficult to capture in the narrow frame of Sides’s analysis. But let’s tackle 1984 in the context of that analysis: the general election debates. The economy was doing well, and although the Iran-Contra scandal had rocked the Reagan administration and Cold War tensions were high, the president was substantially ahead in the polls, where he led by double digits for almost all of election season. The Reagan campaign was even largely positive, focusing on its Morning In America slogan. The lack of change in the polls suggests that the debates had no effect on the election, but there were some exchanges worth unpacking. Look how perfect that is. It shows a vitality and wit that should immediately defuse the concerns of any voter sitting at home wondering about Reagan’s age. It makes the question itself seem silly. And, crucially, it takes a perceived weakness of Reagan’s and turns it into support for one of his most potent lines of attack against Mondale: that the former vice president lacked any substance whatsoever. It’s the political television equivalent of the emotional parts of the bin Laden episode of The Newsroom—everything is terrible and you know it will go back to being terrible, but that one moment is so strong that you’ll probably have to watch the rest of the season (again, maybe this is just me). Basically, if you’re ever watching a debate and ask yourself what the candidates are trying to do with their answers, it’s this. Mondale performed well (in fact, he was perceived to have “won” the first debate), but, as the KAL007 exchange had exposed, he acted more like a high school debater trying to win a state tournament than a candidate for office engaging in the faux-performance that debates had already become. Even though he appeared to be a match for Reagan, he was unable to overcome the fact that, as Reagan pointed out again, Americans were better off than they were four years previously. The polls shifted a point or two after the debates, but Reagan’s lead was never in serious danger. Mondale wound up losing in the biggest landslide in modern electoral politics, garnering only the electoral votes of his home state of Minnesota and the District of Columbia. Sides doesn’t even mention 1984 in his argument about the debates, perhaps with good reason. It was kind of a boring year (though not as bad as 1976), and the outcome was never really in question. But that doesn’t mean the debates provided nothing useful. Reagan’s poor performance in the first, out of character for such a skilled politician, raised the question of his age in the first place—an issue that, had Reagan not responded the way he did, could have become important in the race. 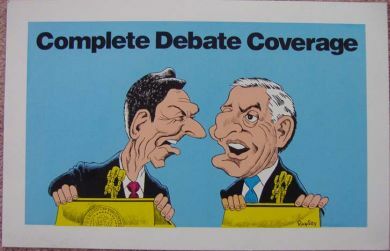 Then, reversing the momentum, the debates allowed Reagan to turn that putative liability into a guarantee of reelection. Most notably, Mondale’s tactic of questioning the president’s policies while accepting and acknowledging how popular he was rings more than a few bells in light of the attempts by Mitt Romney’s campaign to portray President Obama as likable but incompetent. The force of the criticism links Mondale’s “Where’s the beef?” moment with Reagan’s response about his age. A campaign based on a relatively weak (and maybe too complex) argument—the president is an OK guy, but a bad president, or has bad policies despite a good economy—will have a hard time being successful. The bulk of Sides’ argument that candidates’ success is largely dependent on data and less on message is certainly borne out by electoral history, but it’s possible that the success and failure of campaigns reflect those circumstances. It’s difficult to campaign against a well-liked and relatively economically successful president. Gaffes and campaign missteps have and will continue to reflect that. You mentioned that going into the debates with Mondale in 1984, “the Iran-Contra scandal had rocked the Reagan administration.” Actually, the Iran-Contral arms-for-hostages scandal did not become public knowledge until October 1986, two years after Reagan’s 1984 re-election.